Rule the gridiron party with a platter of delicious bites. 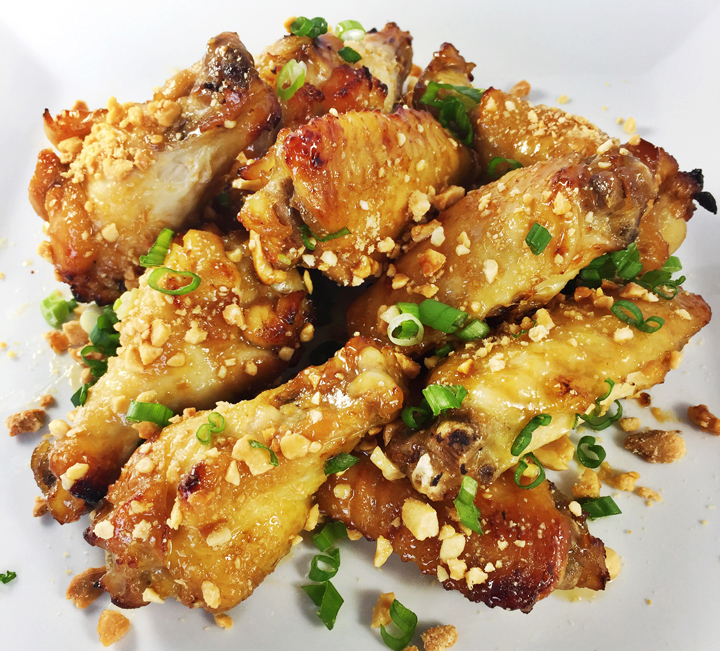 These tasty wings are showered with salty chopped peanuts and crisp green onions over the top of a glossy maple and mustard coating – making them perfect for Super Bowl Sunday. All it takes for these wings to cook is just seven minutes is a presser cooker, then pop them in the oven under the broiler to create a beautiful crunchy exterior. In a pressure cooker, whisk ½ cup maple syrup, Dijon, soy sauce and lemon juice until thoroughly incorporated. Add the wings and toss to coat well. Following the pressure cooker manufacturer instructions, cook the wings on high for 7 minutes then use the quick-release method to drop the pressure to normal. Unlock the pot and remove the wings, cover, and keep warm. Pour the remaining liquid into a 2-cup fat separator. Allow the liquid to sit for 5 minutes for the fat to rise then save the lower 1 cup of defatted liquid. Add the defatted liquid to a clean saucepan over medium heat and whisk in the remaining ¼ cup of maple syrup. Cook until the mixture is reduced to about ¾ cup and is a thick liquid. Meanwhile, turn the oven broiler on low and preheat. Set a cooling rack on a foil-lined baking tray. Add the wings on the rack and baste with the maple liquid. Place under the broiler and cook until the skin is browned and crisp, turning frequently and basting the wings with the liquid every time you turn them. As they brown, remove them, and keep warm until all the wings are finished. (The wingettes may complete before the drummettes.) 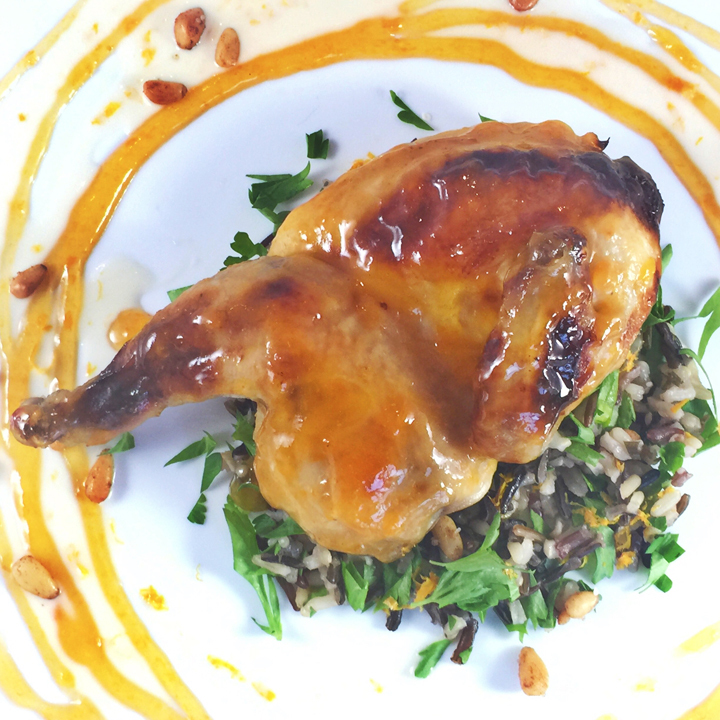 Baste the hot wings one more time with the maple liquid and place on a platter. Sprinkle with the chopped peanuts and the green onions before serving. Serves 4-6 people. Check out the UPrinting article about Fresh Chef Experience! 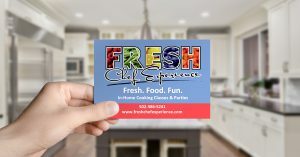 A special “shout-out” to Rafael Rivera at UPrinting for this really great article about Fresh Chef Experience. Click below to read more! While the NFL’s top teams face off on the gridiron, consider serving something more substantial than snack-type foods such as this touchdown-worthy sandwich. 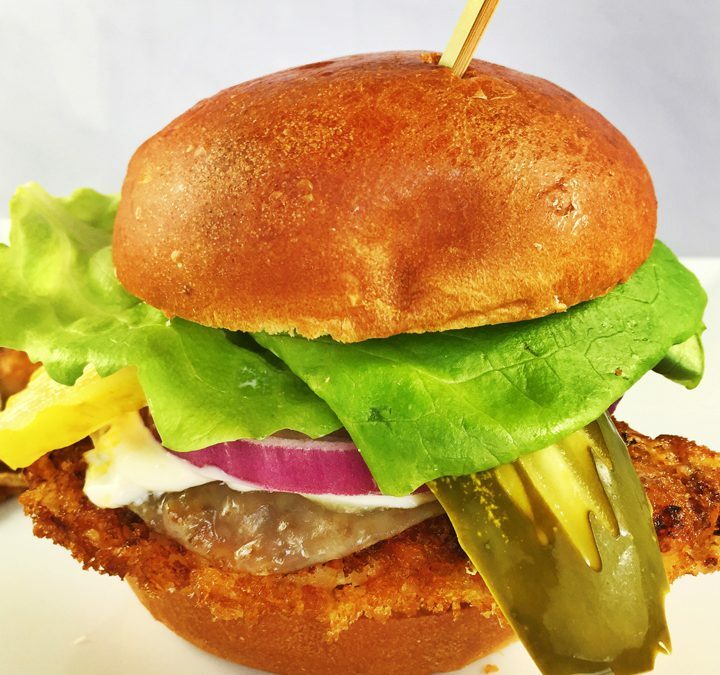 Crunchy breaded pork and provolone with tart lemon mayonnaise and lots of delicious toppings make this the perfect sandwich for the big game or any winter meal. Break the eggs into a wide shallow bowl and beat lightly with 2 tablespoons of water until well combined. Put the flour on a flat-rimmed plate and season with ½ teaspoon garlic powder, ½ teaspoon salt and ⅛ teaspoon of fresh ground black pepper. In another flat-rimmed plate add the panko and season with 1 teaspoon of salt. Dip the pork in the flour mixture coating both sides well. Shake off any excess flour and dip next in the egg. Make sure to let any excess egg run back into the bowl. Next place in the panko crumbs and press the crumbs into all sides of the pork making sure all sides are well coated. In a 12-inch sauté pan, heat ¼ inch of oil over medium-high heat until the oil shimmers and bubbles rapidly when you dip in the corner of the pork. Sauté the chops in batches, flipping once and adding more oil if needed. Adjust the heat as necessary to maintain a steady bubbling. Cook until the pork is golden brown on both sides and the internal temperature is 145 degrees, about 3 to 5 minutes per side. Drain on paper towels; add the thinly sliced pieces of cheese when the pork chops are still warm to melt. Place on a toasted brioche bun and finish the sandwiches as desired with red onion slices, Bibb lettuce, lemon mayonnaise, yellow mustard, and pickles. Poke a long skewer through the sandwich to hold together. Whisk the ingredients together in a small bowl to incorporate thoroughly. 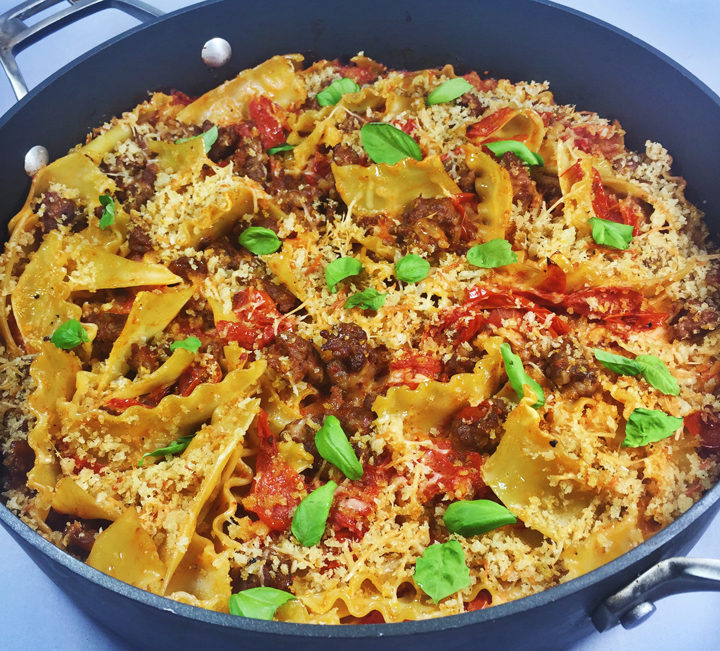 Sautéed garlic and Italian sausage, seared cherry tomato sauce, mozzarella, and broken pasta sheets are topped with cheesy toasted lemon crumbs before popping it in the oven and baking to gooey perfection. To make this delicious dinner even better, it’s a two-pan meal with quick clean up. Preheat the oven to 425 degrees. Melt the butter in a large skillet over medium heat. Add the panko and toss until lightly browned about 7-8 minutes, season with ¼ teaspoon salt and ⅛ teaspoon of pepper. Cool to room temperature, stir in the lemon zest and ¼ cup of Parmesan cheese. Bring a large pot of salted water to a boil. Add a handful of salt and the broken pasta to the boiling water. Stir frequently to prevent it from sticking. Cook until al dente, about 11-12 minutes. Reserve ½ cup of the cooking water, then drain the pasta. Meanwhile, remove the casings from the sausage. Heat the olive oil in a large cast-iron or another oven-proof skillet over medium heat and add the sausage and garlic. As the sausage cooks, break into bite-size pieces. Cook until the edges are browned, and the center is no longer pink. Drain on paper towels and set aside. Pour out any remaining sausage fat leaving just a thin layer on the bottom of the pan. Add the cherry tomatoes and cook until blistered, popping open and slightly softened about 4 minutes. Stir in the lemon juice, 1 teaspoon of salt, ⅛ teaspoon pepper, and cook, lightly-pressing until all the tomatoes are crushed. Add the pasta, sausage, remaining Parmesan cheese, mozzarella cheese and simmer for 2-3 minutes. If the sauce is too thick, add the reserved cooking water, one tablespoon at a time, to thin to your desired consistency. Sprinkle evenly over the top of the pasta the Panko crumbs, and place in the oven for 15 minutes, baking until the crumbs are golden. Top with fresh basil leaves and serve in warmed bowls with more Parmesan cheese on the side.